The best camera is the one you have in your pocket right now, the old adage goes. The iPhone has been in many pockets in the past few years and it has evolved to be good not just because it's the only camera you have, it has evolved to be a fantastic camera, period. 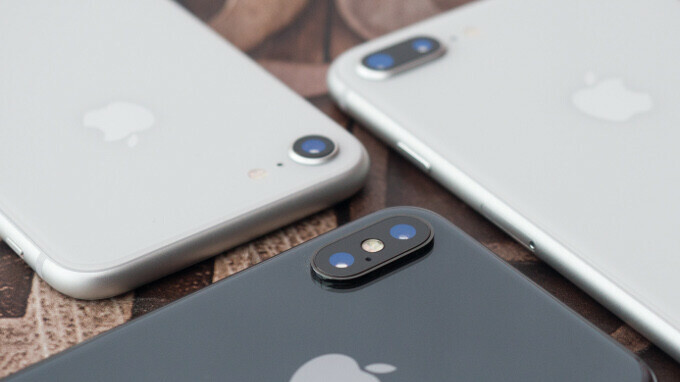 The iPhone has consistently ranked as the camera users took the most pictures with, and part of its appeal is the simple and easy to use stock camera app. In fact, it's so fast and reliable that it easily ranks as one of our favorite camera apps on a phone. At the same time, though, it lacks manual controls, it lacks a histogram, it lacks vertical level indicators, it lacks advanced HDR settings, it lacks fancy effects, and if you want something a bit more sophisticated to get more artistic control over your images, we have selected the absolutely finest camera apps you can get on the Apple App Store right now. ProCamera is a surprisingly simple camera app at the surface, that also hides many advanced features in a way that is unobtrusive yet easy to access. Before we jump into them, though, it’s worth pointing out how stable and crash-free this app is, something very important given that even the most popular iPhone camera apps often crash. 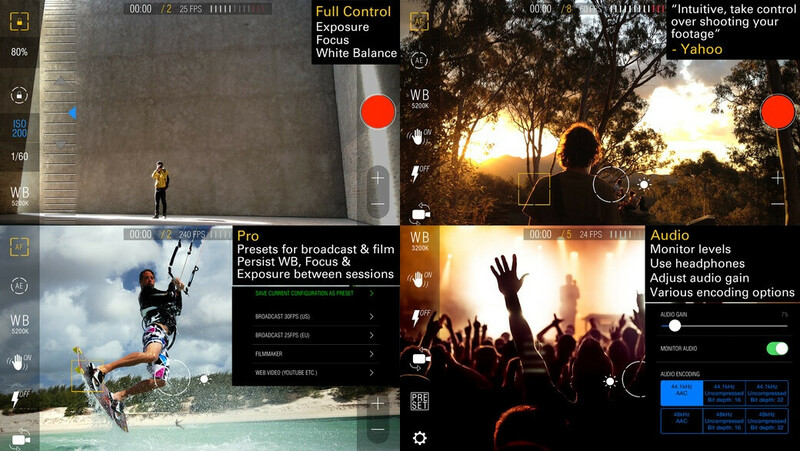 In terms of shooting options, ProCamera has gotten the absolute fullest pack of manual controls available with an extremely intuitive and easy to use interface. We are blown away by the level of fine control and the ease of use of this app (and we don't get impressed easily): you can set ISO, shutter speed (and lock them! ), white balance (down to the Kelvin, with a guide that shows you which settings are appropriate for which conditions), exposure compensation, you also have independent focus and exposure controls as an alternative control and that gives you a much deeper hold over the looks of your photograph (you can naturally lock focus and exposure). It can display a histogram, which is a thing of beauty and usefulness: you get a live histogram that shows you when you start blowing up highlights or going too deep in the shadows. 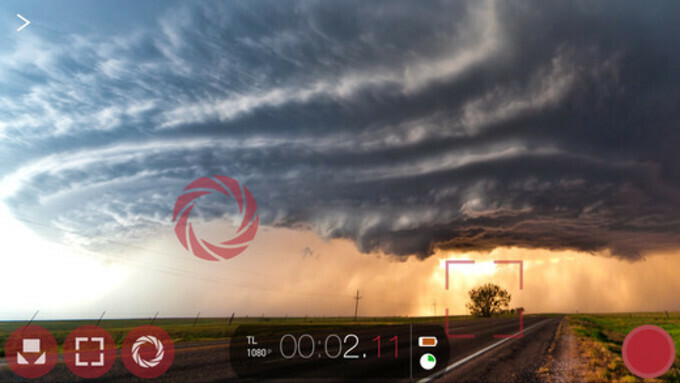 Other neat options include a tilt meter, anti-shake option, and a self-timer, as well as the option to select the right aspect ratio. If you're aiming for maximum-quality, ProCamera delivers with support for the lossless TIFF format, and if you dive deeper in the settings of the app you'll find a treasure trove of adjustments such as fine control of the level of stabilization, JPEG compression levels, and many more. Unlike other camera replacement apps, ProCamera can also be used to record video and it has the neat built-in option to scan QR codes. Its outstanding photographic capabilities, however, make ProCamera our favorite camera replacement to the stock iPhone app. Camera+ 2 is a complete revamp of the popular Camera+ app meant to make use of the extended capabilities of modern smartphone cameras. It has all the manual controls you might need: ISO, shutter speed, white balance and so on. You can easily choose where the camera should focus and which point to use for the exposure using the floating frames that can then be locked to a certain position. Camera+ 2 has support for the dual-lens cameras that have become common on iPhones. Of course, in this version, you can still take photos in RAW format to give you even more options when you're editing your photos later. Speaking of editing, you can do some of it straight in Camera+ 2. The built-in tools let you make the usual color adjustments but also add some effects and filters, so unless you're looking to do some heavy customization, Camera+ 2 will be the one stop shop for your photography needs. Snapseed was acquired by Google a few years ago for a good reason: it features an intuitive swipe-based interface that allows you to edit images on your phone very easily. You have the powerful option of selective adjustments so that you can tap on a particular point and edit just a certain part of an image rather than the whole thing. Snapseed is ad-free, works smoothly, and is probably the best way to edit photos on the iPhone. Things you can do with Snapseed include adding an outstanding bokeh, blurred background effect (useful for portraits), and you can make fine adjustments to a select part of the image (most other editors only allow you to edit the looks of the whole picture). You have the inevitable filters, artistic effects, borders and so on, all combined in an app that has a non-destructive flow and that allows you to go back in edits one step at a time in case you need it. Photoshop has become a synonym for photo editing so no compilation of picture-improving apps would be complete without one of Adobe's products making an appearance. Photoshop Express is a free app that has all the features you can expect. From the basics like color adjusting, cropping and adding filters to more advanced features like blemish removal, Photoshop Express covers all the bases. If you want to be extra creative, there are also tools to add text and stickers or create collages using multiple pictures. Of course, the app has integration with Adobe's professional desktop product, Photoshop CC, so if you have access to it you can quickly export your work and continue tinkering. Maybe you don't have time for all that but still want your pictures to look better, what then? Tap on the magic wand tool and Photoshop Express will make some quick adjustments for you. Polarr is a pretty cool editor that gives the user a wide variety of ways to edit their pictures. Employing a unique UI, the app looks a bit cluttered and confusing at first, but we can easily forgive this once we get acquainted with the wide variety of options that it manages to pack right under our thumbs. It's free, but there is a $5 unlock for users who want to create custom filters and selective area editing. VSCO is an app by the Visual Supply Company, a firm known for developing some of the best film-emulation filters for Adobe Lightroom, and it's no surprise that this expertise has resulted in a collection of some amazing filters that you can get in VSCO. The beauty of VSCO’s filters (or presets rather) is in the subtle measure of the artistic effects that will help you get a sense of the right amount of touch-ups needed for a photo, and also help you avoid overediting your images. The full preset pack costs $5.99, and while you have some free presets, the app starts to truly shine when you unlock the potential of all the presets. VSCO also allows you to edit the strength of each filter, as well as edit all aspects of an image non-destructively. Apart from its filters and effects, VSCO also comes with a ‘journal’ with ideas for shooting, and the apps gets the job done as a camera replacement with separated exposure and focus controls, as well as tilt level. FiLMiC Pro is the number one app for video recording on the iPhone if you want a full manual control over what you record. Completely reworked with Swift, FiLMiC Pro allows you to change the bit-rate, add stabilization and zoom smoothly. Of course, you can separately set your focus and exposure points, as well as lock the focus, you can adjust audio levels, view a histogram, tweak your exposure and so on. FiLMiC Pro also makes it easy to record in a different aspect ratio than the standard 16:9. If you want that more cinematic look, you can use it to record in the Cinemascope standard (2.59:1), Super 35 or Letterbox. The latest version of the application also allows you to start and stop a recording with your Apple Watch. MoviePro is another regularly updated pro-level application with support for the latest version of iOS and iPhones (naturally, including support for 4K video recording). It brings an all-manual video ride that will allow enthusiast smartphone videographers to squeeze the maximum out of the camera with high bit-rates. It packs essential for videographers options: locking the exposure, focus, and white balance, and fully customizable zoom levels for slow, smooth zooming. It is also useful on older devices like say the iPhone 6 where it brings the possibility to record 3K (3072x1728) video at 30fps, with a similar option also available on the iPhone 5s. Kinomatic combines the most advanced manual video recording features along with a powerful built-in editor, all in a surprisingly simple, streamlined user interface. We’re smitten with the speed of edits and the ease with which you can re-arrange trim and mix clips into a finished video project. The powerful manual controls include separate buttons for focus, exposure, and white balance lock, plus you get to see audio levels live. 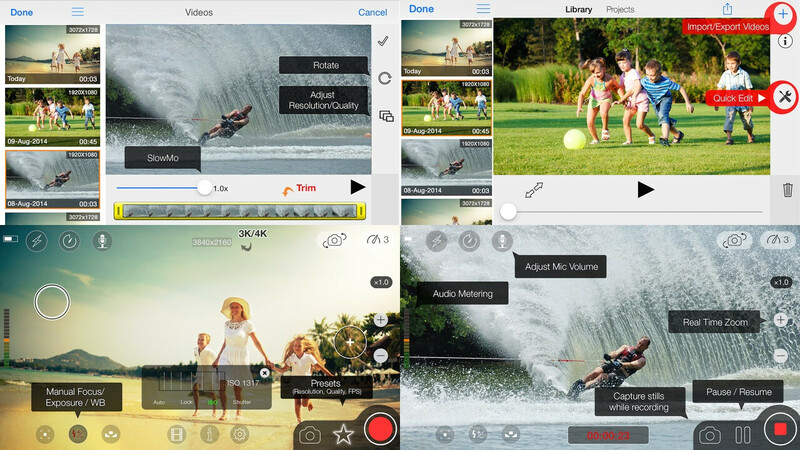 All in all, Kinomatic is a new-comer to video editing apps, but it has become an instant favorite for iPhone videographers. 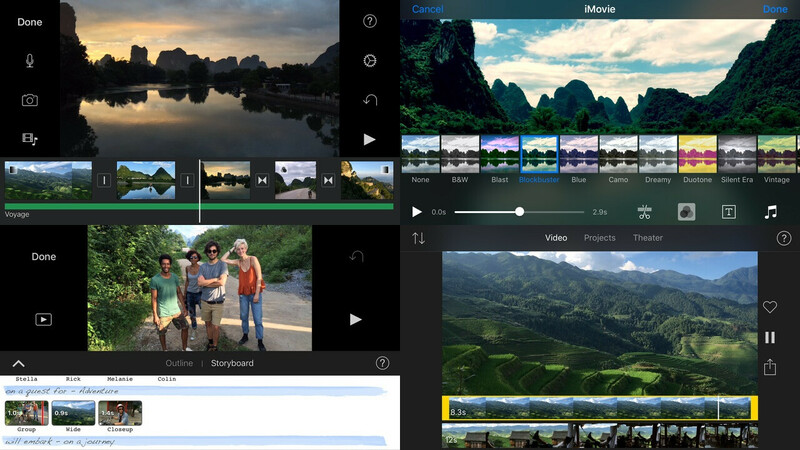 iMovie comes free with new iPhones and it's an absolutely stellar video editing app. It is a full-on video editor with support for 4K videos and it edits them with ease on the latest iPhones. This alone is a capability that many desktop apps don't support. What can you do with iMovie? From simply cropping a video to arranging multiple videos, adding text, transitions and music, you can do it all with iMovie. True hipsters require beautiful custom fonts, hand-drawn elements, and inspiring text to images, and if you’re one of them, Over is the app that delivers best to your needs. With its computational effects that convert photos into art-like pieces, Prisma has taken over the world. The images it produces are of better quality than all other filters or effects. The camera of the iPhone has a wide-angle lens that looks great for capturing all sorts of images (and is particularly great for landscapes), but often times it would slightly distort lines and otherwise straight buildings would appear to be leaning in like the tower of Pisa in Italy. SKRWT is an app that will straighten such irregularities without ruining your image, a task that is otherwise quite hard to achieve in even more advanced photo editors. The Hypocam app will allow you to focus on perfecting your black and white photography and discover the art of nuance. It comes with a set of presets that you can use as well. If you’re shooting portraits as a hobby, you probably know that it often takes hours of Photoshop edits until you get a blemish-free face that looks fashionable and just good. Facetune 2 aims to automate and bring down the editing effort to a bare minimum, and while it won’t create professional portraits, it’s doing a marvelous job at improving the faces of people in your iPhone photographs. A non-destructive way to add film grain, textures, light leaks and beautiful gradients to images in seconds, Mextures will help you experiment with adding style to your photographs.